Driven by the need to protect tuna stocks from overfishing and in response to growing global consumer demand for sustainable seafood, progressive tuna companies are fast adapting their fishing and supply chains to ensure they can meet these new standards. The Indonesian tuna industry and government work hand in hand to ensure quality and food safety, traceability and a sustainable industry. It’s because we care for our customers, our oceans and our communities. All leading one-by-one caught tuna suppliers follow the regulations as described in the code of conduct. They are committed to ensuring best food safety practices, which is reflected in the certifications held by our Indonesian tuna industry. Our producers are certified according to international quality and food safety management systems like Good Manufacturing Practice, ISO 9001, Halal, HACCP, IFS Food, and BRC Food. Several fisheries have Fairtrade and Dolphin safe certifications and 14 fisheries are preparing for MSC certification. 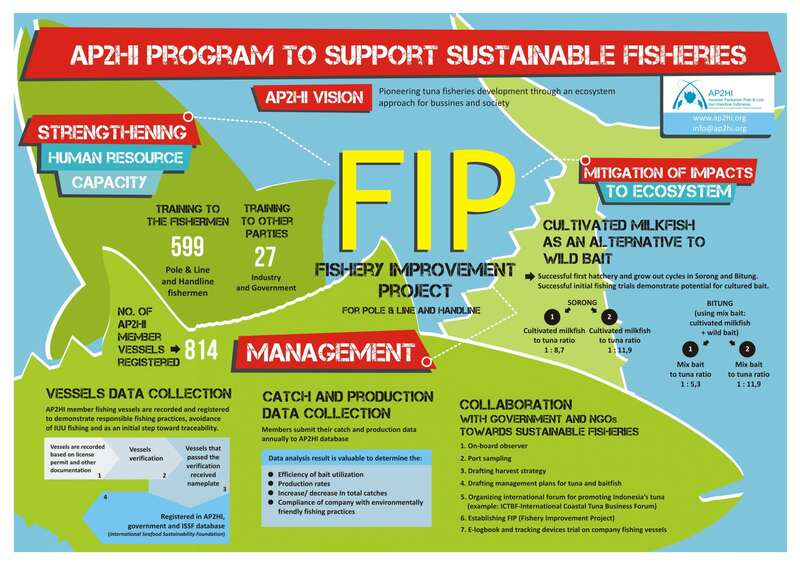 In the meantime additional initiatives are taking place through a Fishery Improvement Project with the aim to improve the sustainable fishing practice and impacts for long-term. Download this infographic to gain more insights in the FIP.